1. 14th JULY till 13th AUGUST 2017. 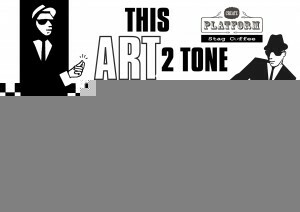 A new This ART 2 Tone exhibition by Teflon at Stag Coffee, 108-110 High Street, Ashford, Kent TN24 8SD. FREE! 2. Thursday JULY 20th 2017, 7pm till 11pm. TEFLON’S SKA TRAIN. With a Q&As session + skanking of the highest order with DJs Sir Ben Watson & King Nathan FUSS Atkins. Create Platform Event. Tickets £5 online: www.createfestival.co.uk or OTD if any left. You are currently browsing the classic 2-tone graphics news archives for July, 2017.